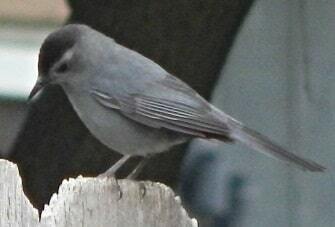 The Gray Catbird is in the family of Mimidae which includes mockingbirds and thrashers. 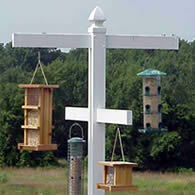 Well known by bird watchers for their habit of mimicking sounds of other animals and bird species. One 4 1/2 minute song included 170 distinct phrases. The cat-like mewing call is generally an alarm call. 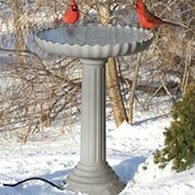 Informing others that a predator or danger exsist for the birds. Fairly inquisitve, this bird will pop out of the thick brush if it hears you approaching then, once satisfied will quickly dart back into cover and settle down. After a time you'll notice the bird will continue going about his business with you around. Both male and female give the "meeow" call. This bird measures about 8 to 9 1/2 inches long. Mainly gray, darkest on wings and tail. Look for a black cap and a rust colored patch under the tail. A monogamous bird. Pairs are usually bonded at the beginning of the season. During courtship, watch the male as he raises his head up or down while fluffing out its body feathers in the presence of a female. Once pairs are formed, the nest building begins. The female builds most of the nest. The male will help with nest construction, but usually adds very little. The nest is cup shaped, made of twigs, leaves, grasses and grapevine bark, lined with rootlets, pine needles, and horsehair. The nest is generally located in a shrub, thick vine, or small tree about 2 to 10 feet above the ground. The female lays 2 to 6 dark blue-green eggs that will be incubated by the female only. Incubation last about 12 to 14 days. The young will leave the nest within 10 to 13 days after hatching. The diet of this bird consist of insects, spiders, and fruit. They eat a lot of berries. As a mater of fact, berries make up as much as 50 percent of their diet. 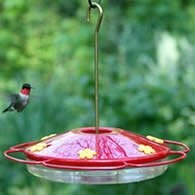 Primarily feeds on the ground and in foliage. 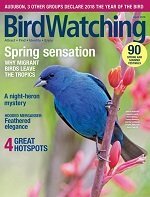 Catbirds vacate their summer range to winter in Mexico, Central America, and the Caribbean. Small but increasing numbers remain in the North through the winter. 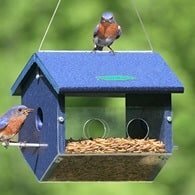 If you see these birds in your backyard during winter, try placing suet and raisins out for these birds to eat.